Do you believe in healthy living? Do you like your own meat ground ? Think about all the chemical and additives that are added to ready to food, does this sound to be a good replacement? If you are looking for a best meat grinder for your home then STX International STX-3000-TF Turboforce will definitely be a wise choice for you. 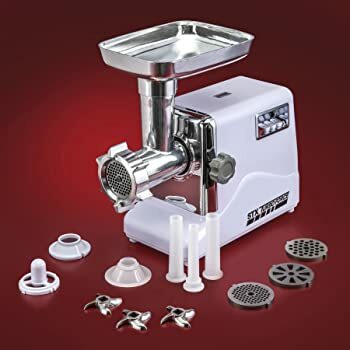 It is not an easy task to figure out which meat grinder to go for and that is why most people face problems in selecting a quality one for their needs. This machine is a good choice in terms of the overall experience and that is why, anyone interested in grinding meat can depend on this. The unique selling proposition of this machine is the brilliant engine which is of 3000 watts. This is more than enough to process anything in your home or in a small restaurant. This engine is the best one right now which can process an enormous amount of meat for you at ease. It can grind 175 -225 pounds of meat in an hour. It has a circuit breaker. If you are a customer who tends to worry about appliances overheating or causing electrical problems, you will love this machine. It is an easy task to use this grinder machine if you have any experience with food processors before. There is a simple manual that comes with the product which describes everything. The accessories are easy to attach and detach. One big worry about any meat grinder is the cleaning methods. Blades are made up from stainless steel which means they will not rust easily. It is very easy to clean. What you will have to do is simple. At first, take the blades and plates away from the main grinder and then wash them separately. If you check out reviews, you will find that this has many five-star ratings. There are very little negative reviews about this product and if there is any, it suggests that durability and reliability are closely linked, comes with a complete guarantee – repair and replacement included “3 Year – 100% Guarantee “. They rave about the quality of the meat – almost like the ones produced by commercial grade meat grinders. They also love how it looks on the outside. This machine is also commended for its ease-of-use. Customers also had an easy time cleaning and maintaining it as assembling and disassembling it is practically a no-brainer. Also comes with sausage stuffers and kubbe attachments. 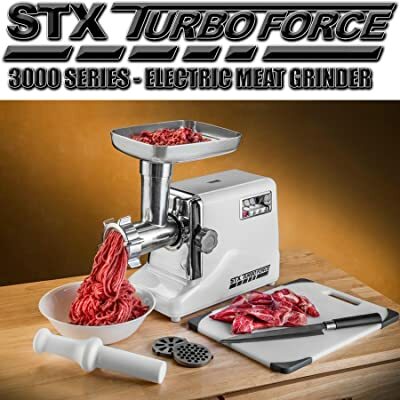 All in all, “STX International STX-3000-TF Turboforce ” is a great meat grinder if you are looking for a grinder that has quality and durability. It will make your grinding life a lot easier within minutes. Traeger Grill Reviews : Which is the best grill for your home ? Do you have a tenderizer that connects to the STX grinder?